Luqa’s phallic monument and the controversy about whether or not it should be removed ahead of the Pope’s visit next weekend has made it to the international headlines with a story on the BBC website bbc.co.uk becoming the second most read and the fourth most shared. The story also made it to USA Today’s must read stories where a poll on whether the monument should stay or go was included. The Spoof used the shell of the story to come up with a ficticious one of its own. A photo of Malta’s own famous phallic symbol was also posted on CNN’s iReport, where people upload the news themselves. The monument now even has its own fan club on Facebook with the number of fans increasing from 800 this morning to more than 1,500 this afternoon. The monument is the work of ceramic artist and sculptor Paul Vella Critien. 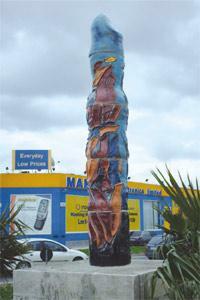 Pope Benedict XVI will visit Malta this weekend and his route will driving past the Luqa roundabout, where the column stands tall.